Pineapple fruit is rich in B-complex group of vitamins like folates, thiamin, pyridoxine, riboflavin and minerals like copper, manganese, potassium, calcium, fiber, vitamin A and vitamin C. In addition it is low in calorie and contains no saturated fats or cholesterol. The benefits of pineapple can be achieved through eating fresh, canned, or frozen pineapple or by drinking its juice. Besides, pineapple helps to build healthy bones. Pineapples are rich in manganese, a trace mineral that is needed for your body to build bone and connective tissues. Just one cup of pineapple provides 75% of the daily recommended amount of manganese. The benefits of pineapple can affect the growth of bones in young people and the strengthening of bones in older people. While many people often take extra vitamin C or drink extra orange juice when they are having cold, few consider eating pineapple. The benefits of pineapple when you have a cold or cough are the same as the benefits of orange juice, but there is an additional benefit of pineapple. Bromelain, proteolytic enzyme which is found in pineapples, has been found to help suppress coughs and loosen mucus. Proteolytic means "breaks down protein", which is why pineapple is known to be a digestive aid. It helps the body digest proteins more efficiently. It helps you to LOSE WEIGHT! Eating pineapple can highly cut down your sweet cravings because of its natural sweetness, saving you from a lot of sugar-induced calories. Incorporating a lot of pineapple in your meals will also help a lot in weight management because pineapples can make you feel full without giving you an ounce of fat. 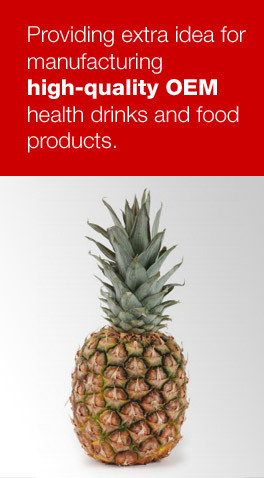 For more benefits of pineapples, you may refer to Organic Facts website.